SAT or ACT Which is best for me?. 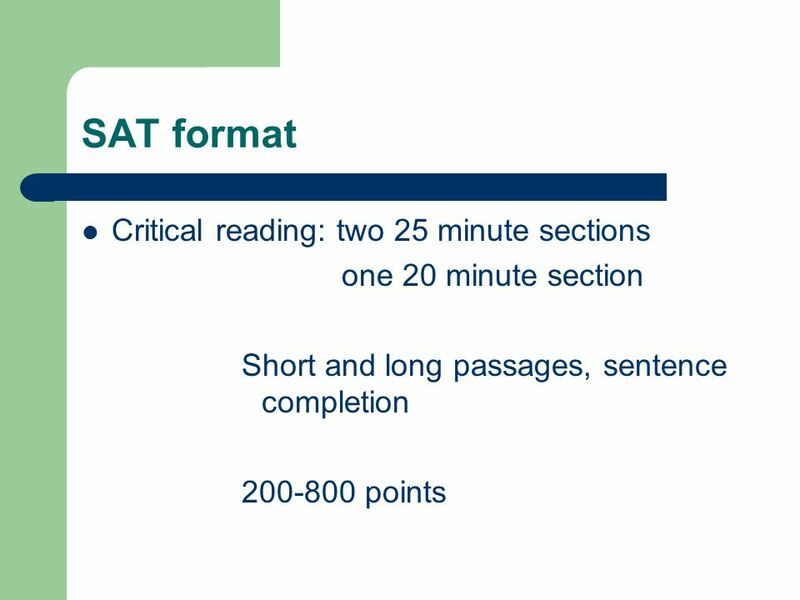 SAT format Critical reading: two 25 minute sections one 20 minute section Short and long passages, sentence completion. 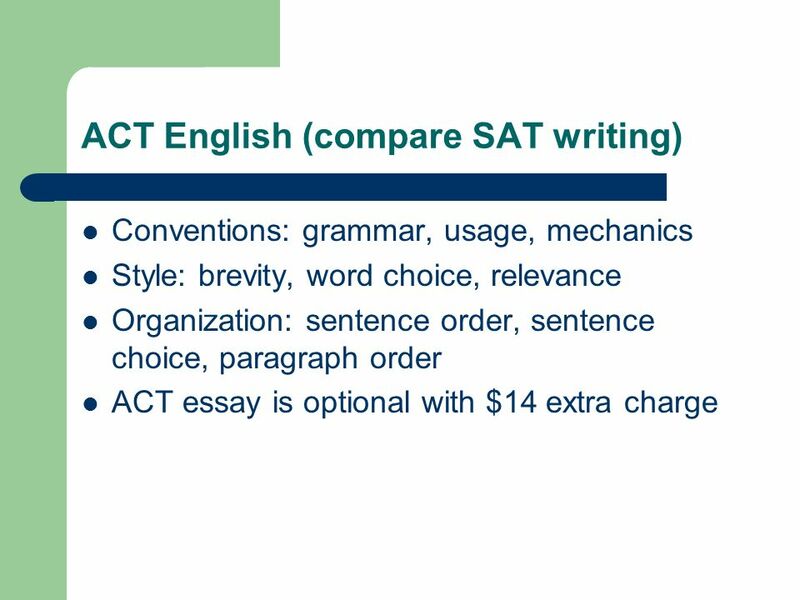 1 SAT or ACT Which is best for me? 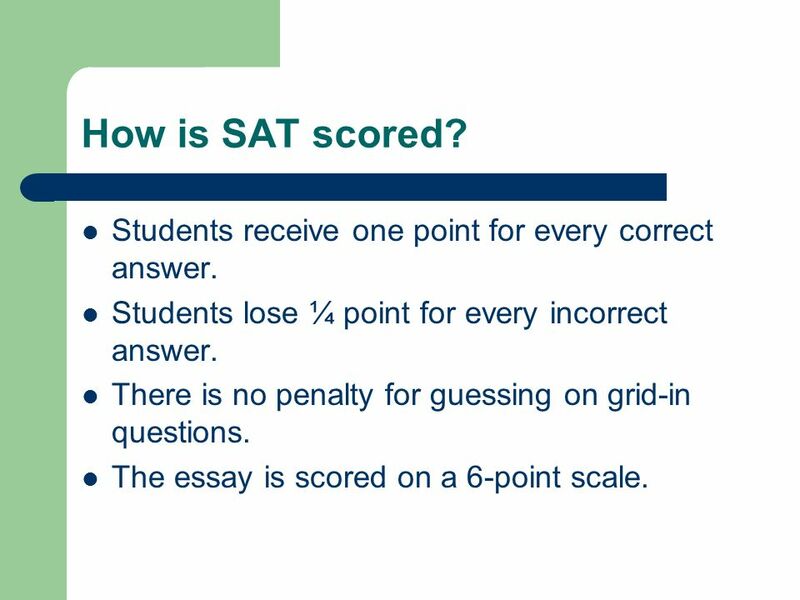 6 How is SAT scored? Students receive one point for every correct answer. Students lose ¼ point for every incorrect answer. There is no penalty for guessing on grid-in questions. The essay is scored on a 6-point scale. 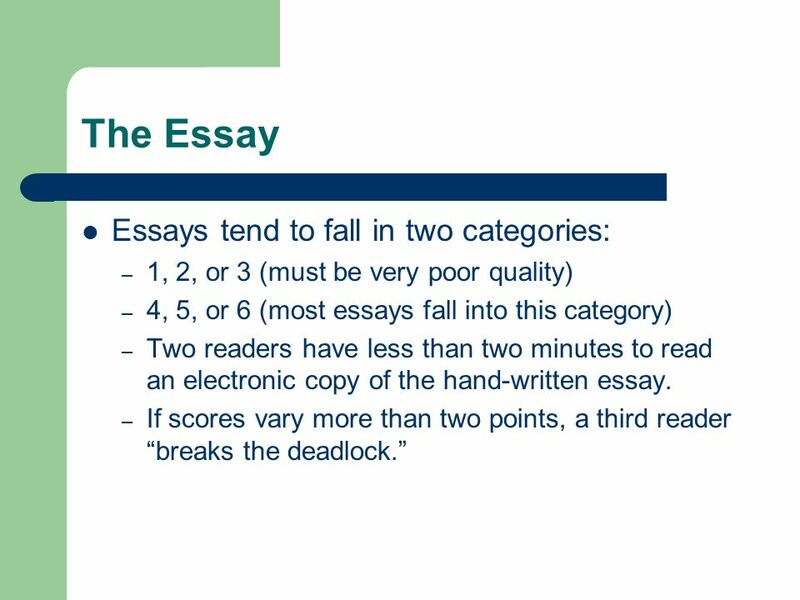 7 The Essay Essays tend to fall in two categories: – 1, 2, or 3 (must be very poor quality) – 4, 5, or 6 (most essays fall into this category) – Two readers have less than two minutes to read an electronic copy of the hand-written essay. – If scores vary more than two points, a third reader breaks the deadlock. 8 Why is 600 the lowest score? Each section is worth between 200-800 points. 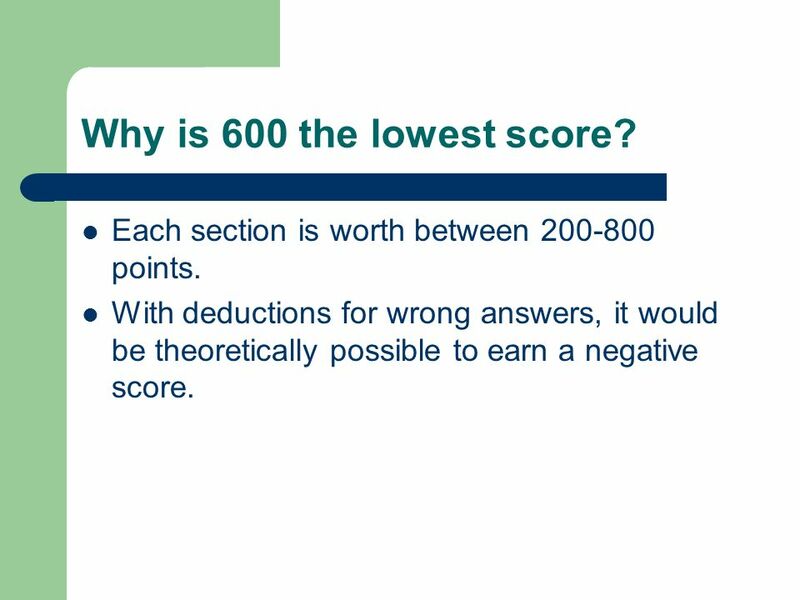 With deductions for wrong answers, it would be theoretically possible to earn a negative score. 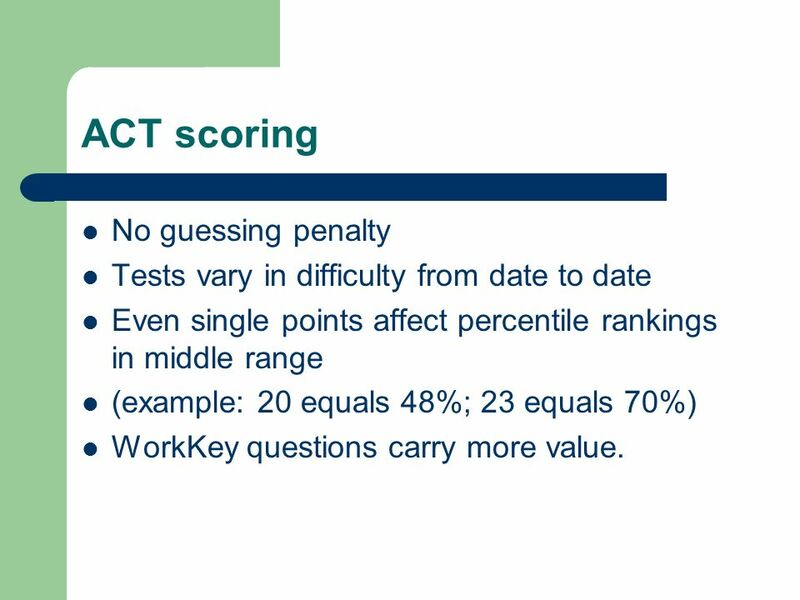 10 ACT scoring No guessing penalty Tests vary in difficulty from date to date Even single points affect percentile rankings in middle range (example: 20 equals 48%; 23 equals 70%) WorkKey questions carry more value. 12 SAT Reading Prose fiction passage: short story or excerpt from novel Social science passage: essay or excerpt about anthropology, archaeology, business, psychology, education, economics, law Natural science passage: essay or excerpt about anatomy, physics, biology, medicine, geology, botany, zoology, chemistry, etc. 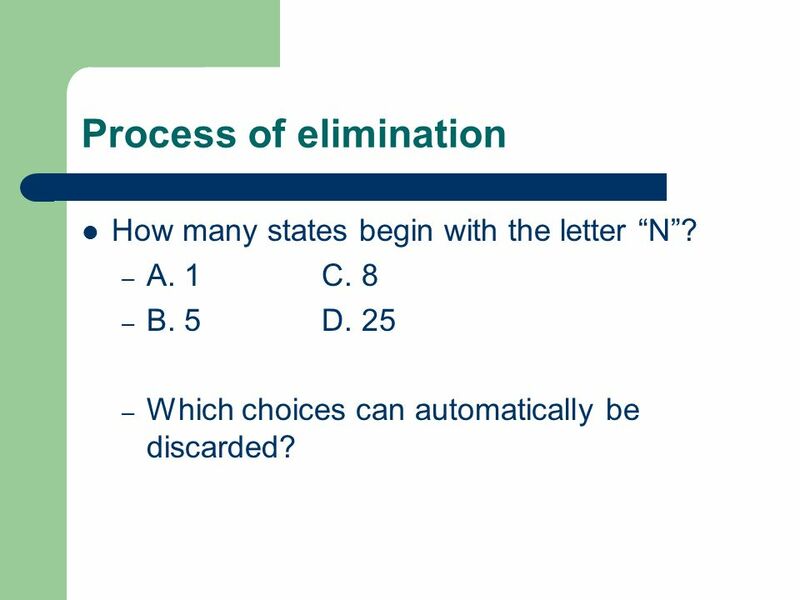 13 Process of elimination How many states begin with the letter N? – A. 1C. 8 – B. 5D. 25 – Which choices can automatically be discarded? 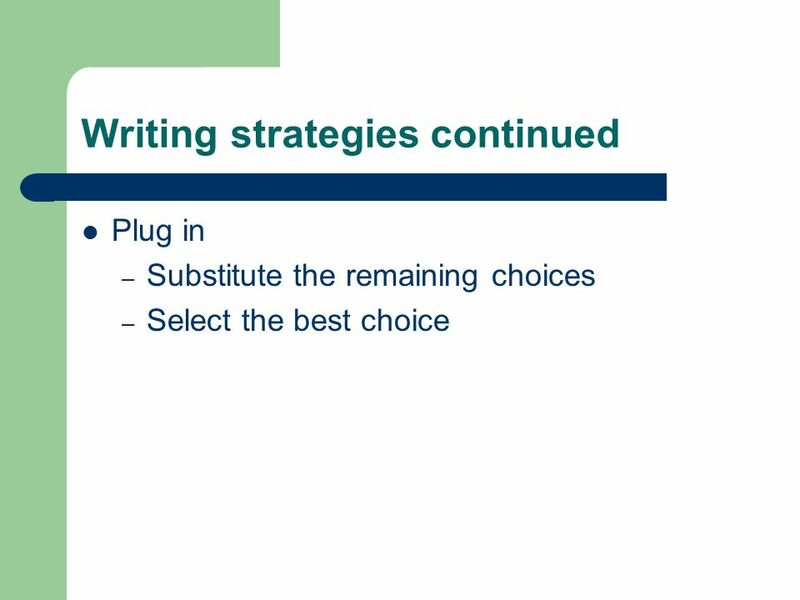 Download ppt "SAT or ACT Which is best for me?. SAT format Critical reading: two 25 minute sections one 20 minute section Short and long passages, sentence completion." Multiple Choice: New format (2004)- 100 questions in 80 minutes 25% molecules and cells 25% heredity and evolution 50% organisms and populations ¼ point. INTRODUCTION TO THE GRE GENERAL TEST Margaret Krantz Hanover College Career Center Director. ACT Explore PSAT SAT Subject Tests ACT AP. Post-Secondary Planning Standardized Testing Why is testing necessary? 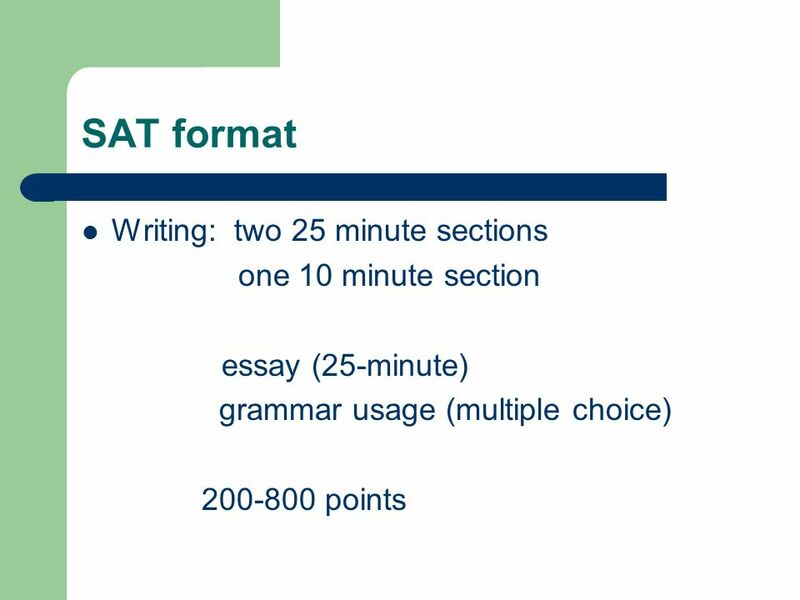 The Official SAT Online Course. – It tests the same things taught every day in high school classrooms: reading, writing and math. – SAT questions represent. 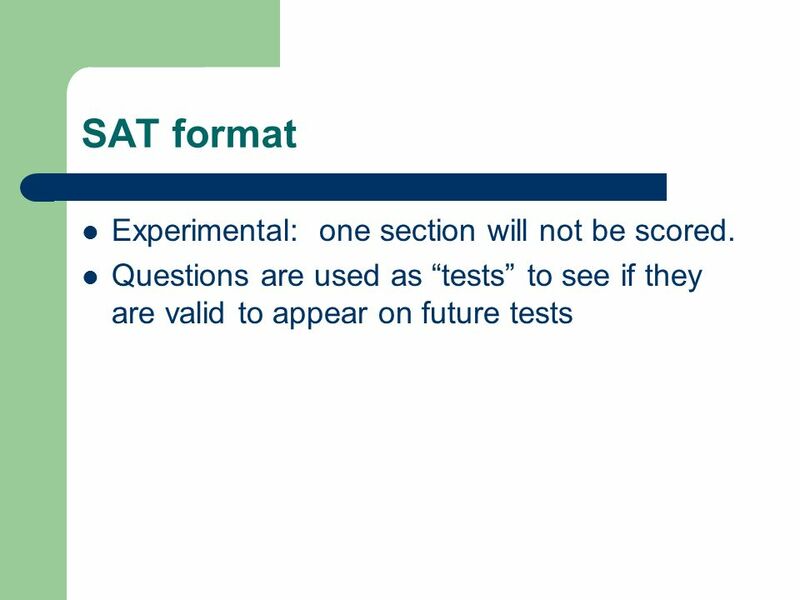 1 Learning about the SAT (and ACT) Read each slide, take notes, and then press enter to proceed to the next comment or slide. 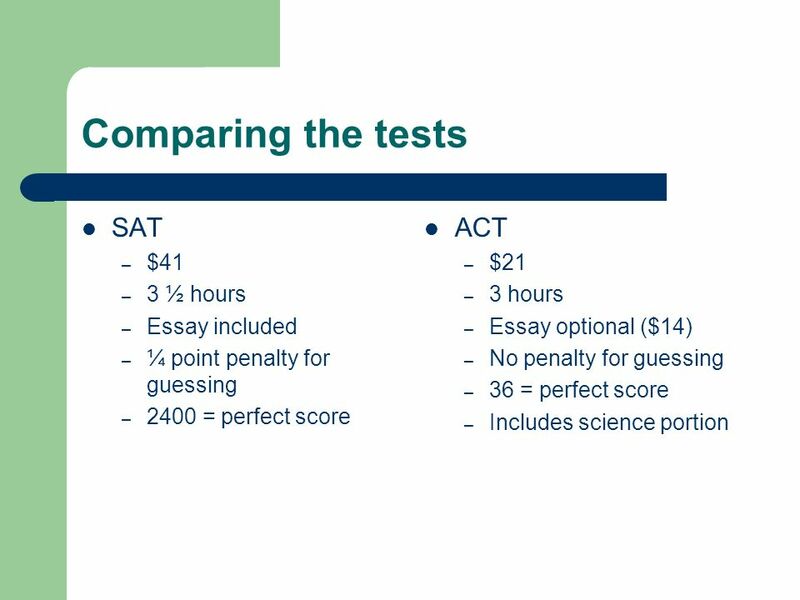 SAT vs ACT: which test is a better fit for you? 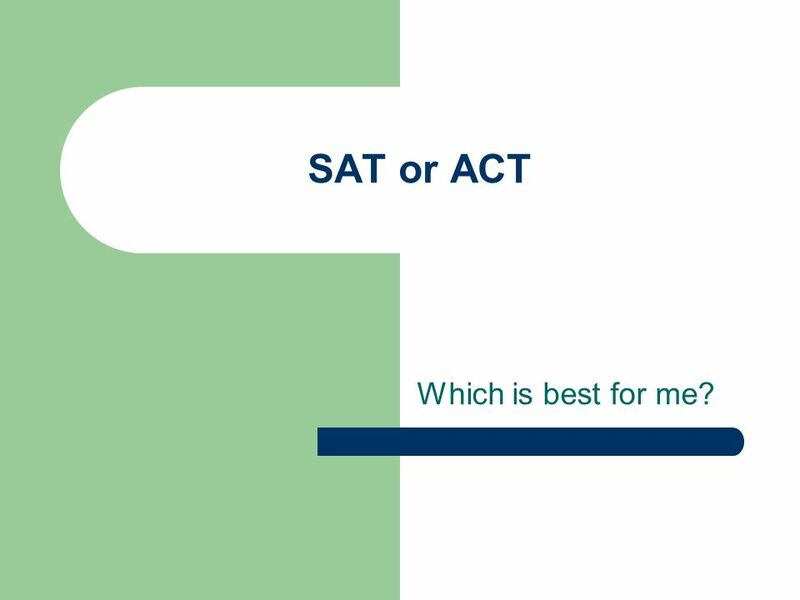 If you’re not sure which test you would prefer, consider the key differences between the ACT and SAT. 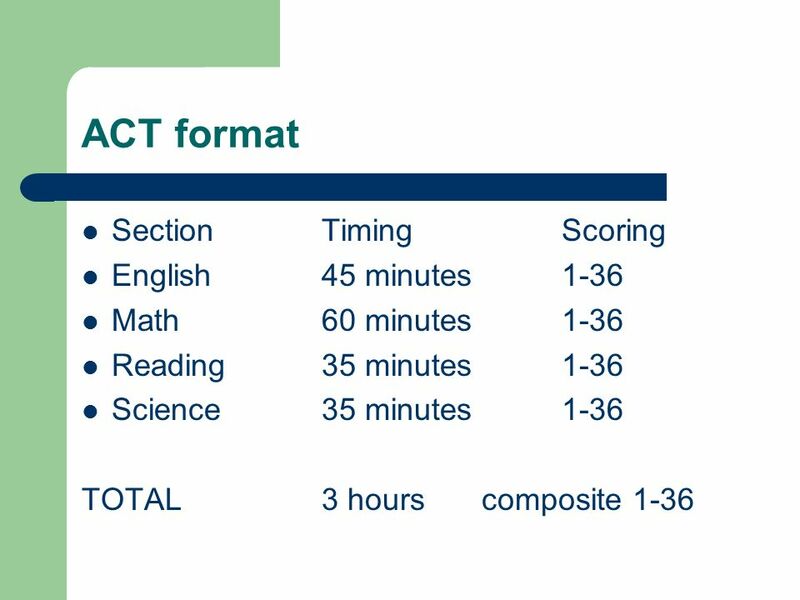 ACT vs. 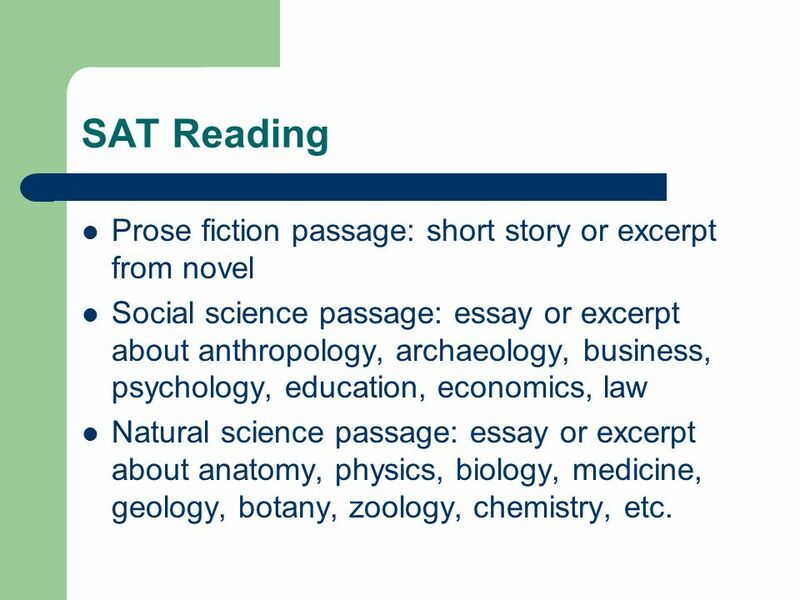 SAT FAQ What is the ACT and SAT? College Entrance Exams. Writing MC Questions at the High School Level Targeting both KCCT and ACT KASC Conference 9/29/ 2008 Taylora Schlosser. SubjectNumber of QuestionsTime Allowed English 30 minutes Usage/Mechanics30 Rhetorical Skills20 Math 40 minutes Pre-Algebra/Algebra22 Geometry18 Reading2520. Standardized Testing. Standardized Testing Defined A standardized test is designed in such a way that its administration, scoring and interpretation are. Prepare for the PSSS: A Step to the Future Skills Tested on the PSSS Sample PSSS Questions Scoring the PSSS Test Preparation Strategies Prepare for the. The PSAT and Beyond: What You Need to Know. Roadmap for tonight 1. Introduction to the PSAT 2. Interpreting your results 3. Going from the PSAT to the. By taking the PSAT and the PLAN, you have already taken your first steps toward college. 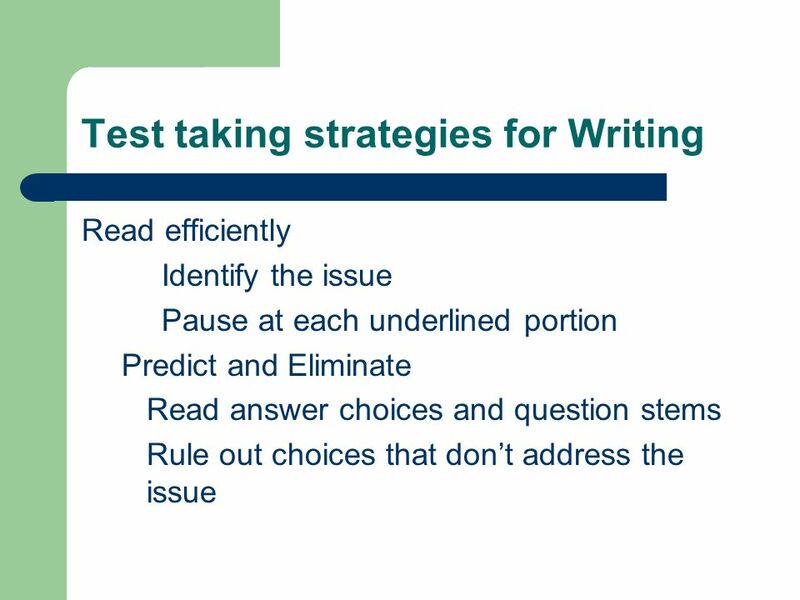 Both tests show you the kinds of reading, math and writing skills. ACT EXAM Advisory 207 Ms. Sophia Papaefthimiou. ACT exam  ACT stands for American College Test  It is a standardized test you take as a Junior  It. The EXPLORE TEST Coming in September SubjectNumber of QuestionsHow long it takes English4030 minutes Math3030 minutes Reading3030 minutes Science2830. GETTING TO KNOW THE SAT TIPS AND TRICKS TO IMPROVE YOUR SAT SCORE MR. TORRES 10/02/2013. 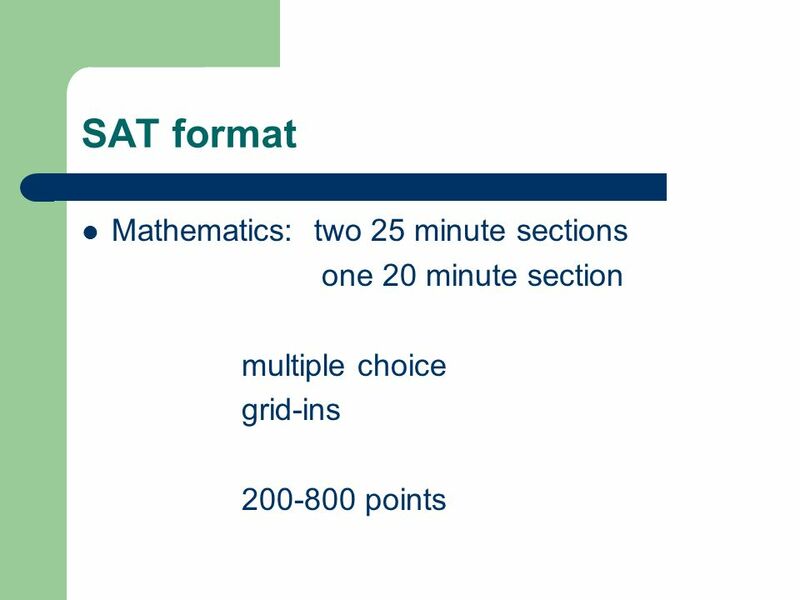 Introduction to the SAT. SAT Score- just one factor colleges look at Also look at – Academic record (grades) – Involvement in school activities – Application. ACT PREP CLASS THURSDAY, SEPTEMBER 22, 2011 Agenda 1. Cornell Notes on ACT Reading and Science Test. College Admissions Testing: What You Need to Know.